For Centuries, Ocean City Has Been the Place to Be. Europeans arrived in 1524 when Giovanni da Verrazano surveyed the east coast of North America. By the 17th century, British colonists had moved north from Virginia and settled in the area. In 1878, heroes took up residence. The U.S. Life-Saving Service, an ancestor of today's Coast Guard, established a station here. Their mission: to venture out in stormy seas and rescue shipwreck victims. The second station, built in 1891, is now the Ocean City Life-Saving Station Museum, enshrining Ocean City's history and saluting the brave men who worked here. As for the history of the Ocean City, Maryland boardwalk: In 1900, our first wooden walkway was constructed. Trimper's Amusements opened shortly after. Unlike today, however, the boardwalk wasn't a year-round fixture. The boards were actually taken up in the winter, and stored until the following spring! Ocean City’s inlet history is just as interesting. In August of 1933, a powerful storm ripped open a new channel from the bay to the ocean. Engineers made the inlet permanent, and with its new harbor, Ocean City became one of the east coast's premier sport fishing destinations–the White Marlin Capital of the World. And what railroads did for Ocean City vacations in the 19th century, bridges accelerated in the 20th. In 1952, the Chesapeake Bay Bridge offered quick, direct access from Baltimore and Washington. In 1964, the Chesapeake Bay Bridge/Tunnel opened a direct connection to the Virginia Tidewater region. In a few short years, Ocean City, Maryland, established itself as the favorite resort for visitors from all over the eastern seaboard. Today, Ocean City stretches along 10 miles of beautiful beach from the Inlet to the Delaware state line. Our classic wooden boardwalk offers nearly 3 miles of food, games and shopping. The Roland E. Powell Convention Center is a highly popular site for meetings of all sizes. And with more than 10,000 hotel rooms and 21,000 condominiums, we have accommodations for every need and taste. In other words, there's never been a better time to visit us than right now. 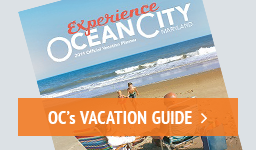 So make a little history yourself, with a trip to Ocean City, Maryland!